These 9 members have poured through the data and agonized over the winners and losers for each matchup and each round. Will they be lauded as heroes, or will it be another BlueRibbonFail? Be sure to voice your opinion and discuss these topics on Twitter (#BlueRibbonPanel or #BlueRibbonFail)! Michael Choi is Professor of Medicine and Division Director of Nephrology at MedStar Georgetown University Hospital. He previously served as the Nephrology Fellowship Program Director from 1996-2009 and Clinical Director from 2009 to 2018 at the Johns Hopkins University School of Medicine. Dr. Choi is the immediate Past President of the National Kidney Foundation (NKF). Deidra Crews is Associate Professor of Medicine in the division of nephrology at Johns Hopkins University. She serves as the Department of Medicine’s Associate Vice-Chair for Diversity and Inclusion and received the 2018 President’s Frontier Award from Johns Hopkins to support her research on the impact of racial disparities on chronic kidney disease. Dr. Crews is also part of the Executive Committee for the American Society of Nephrology (ASN). Melanie Hoenig is Associate Professor of Medicine at Beth Israel Deaconess Medical Center. She is the course director for Homeostasis 2 at at Harvard Medical School (Renal, GI and Endocrine Physiology and Pathophysiology) and co-chaired their recent curricular reform efforts. 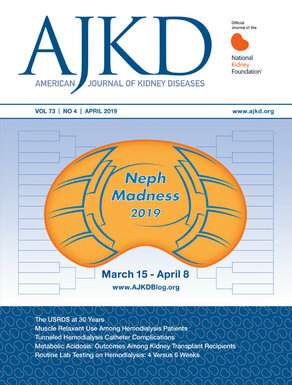 Dr. Hoenig just stepped down as Editor for the ASN’s KSAP and is more eager than ever for NephMadness to begin! Holly Kramer is Professor of Public Health Sciences and Medicine in the Division of Nephrology and Hypertension at Loyola University Medical Center. She is President of the NKF and Vice Chair of KDOQI Controversies and Commentaries. Because she is a Hoosier, she is by default a huge basketball fan. Eleanor Lederer is Professor of Medicine at the University of Louisville School of Medicine, Chief of the Division of Nephrology, and the Associate Program Director of their nephrology fellowship training program. She is a physician scientist with an interest in stone research. Dr. Lederer is a Past President of the ASN. Mark Okusa is Professor of Medicine, Chief of the Division of Nephrology, and Director of the Center for Immunity, Inflammation, and Regenerative Medicine at the University of Virginia. He is also the director of the NIH T32 Kidney Disease and Inflammation. He is a physician scientist and has clinical and research interests in AKI. Dr. Okusa is Past President of the ASN. Roger Rodby is Professor of Medicine at Rush University Medical Center and Program Director of their nephrology fellowship program. He is a Community Leader for the ASN’s online Communities, and Co-Director for the ASN Board Review course. He is a member of the ASN’s Media and Communications Committee and a member of the AJKD Social Media Advisory Group.